A Command Station is a device that converts the orders of a person or computer into the correct protocol and then sends them to the decoders on a layout. A person gives orders by using a controller connected to the Command Station. A computer gives orders by sending them through a cable connected to the Command Station. Rocrail connects to your Command Station, and then your command station connects to your layout. The decoders on the layout listen to commands coming from the Command Station. Each decoder has its own address. If a decoder gets a command with its address, it will do something. 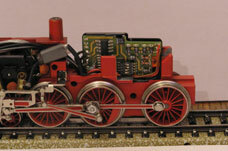 Each digital locomotive has a decoder that listens for commands to start, stop, reverse direction, or trigger functions that turn on a light or play a sound. There are external decoders for turnouts, signals (semaphores), and other devices like turntables which convert the digital commands into electrical actions. Track sensors can be used to send information back to the Command Station from the layout. When a locomotive passes over a piece of track with a sensor, a feedback decoder creates an event command and sends it back to the Command Station. If you want Rocrail to run your locomotives automatically you need track sensors and feedback decoders to send events to Rocrail. Rocrail needs these events to determine where a locomotive is, tell it to stop, change direction, and go to another part of the layout. A Command Station usually needs a transformer and a booster to work. The transformer gives the power, and the booster amplifies the Command Station's orders and sends them to the track. Older systems will have a separate transformer, booster and control unit. Newer systems may have all three in one single device. See the Rocrail Hardware projects for more information. 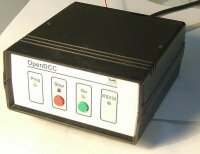 A feedback decoder is really an encoder, it encodes an electrical signal into digital information that the Command Station can read. Some layouts have a separate connection between the feedback encoders and the PC which is not connected to the Command Station. The commands from Rocrail to the layout go out through the Command Station, but the events coming in from the layout to Rocrail come through this second connection.